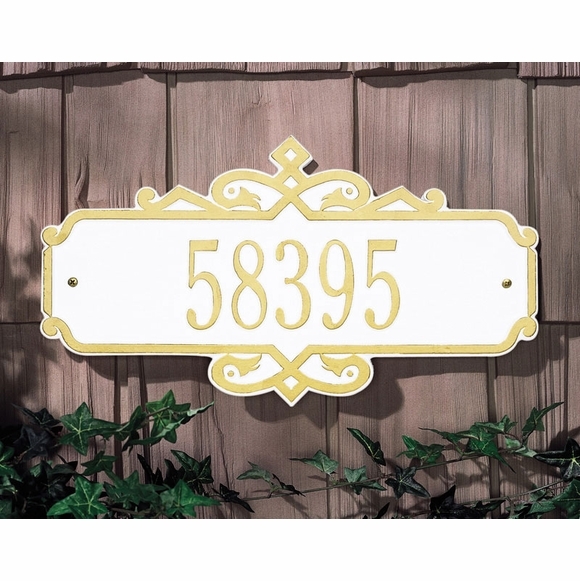 Custom House Numbers Plaque - - elegantly framed by an eye-catching prestige border. Made in USA. Wall mount 16.25" x 8.75" address plaque is made to order in your choice of color combinations and one address line. Holds up to five (5) 3" characters or up to twelve (12) 1.75 characters. Personalize with your house number, as shown in the sample, name, or full street address if it fits. Shown in WG white with gold characters. Custom House Numbers on cast aluminum address plaque and elegantly framed by an eye catching stately border. Made in USA.